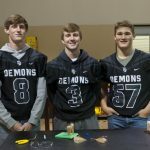 Perkins-Tryon High School seniors Caden Williams and Zach Frazier decided to use the principles they are learning in Meridian Technology Center’s Pre-Engineering STEM Academy to better another passion of theirs: football. For their capstone project, Williams and Frazier wanted to create a tee that would keep the football from rolling off when Oklahoma’s trademark wind blew. Homeschool senior Wade Lopp was an integral part of the team as well, as he made the ideas a reality. 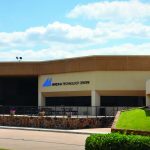 Lopp does computer-aided design for RPX Technologies, a tech company in Stillwater. Since the team would need to use a CAD program to design and create the evolving prototypes of their tee, these skills were invaluable. “They came up with the idea, I do the CAD,” said Lopp. His skills were challenged and strengthened with this project. He joked about how he would take his design to Meridian’s CAD instructor, Russell Frick, to perfect his designs before they went to the 3D printer. “He’d fix it in a couple of minutes,” Lopp laughed, describing how he had been working much longer to solve the same problem. Lopp digitally designed and 3D-printed the multiple iterations of the tee the team created, as well as the final product. He also directed and recorded the results of the tests at the wind tunnel. The team found other outside resources as well. “I always tell my students to go to the experts on their projects,” said pre-engineering instructor Debbie Short. 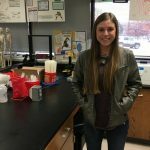 She suggested they talk to Dr. Kurt Rouser at OSU’s College of Engineering, Architecture and Technology about testing their tee in the wind tunnel. 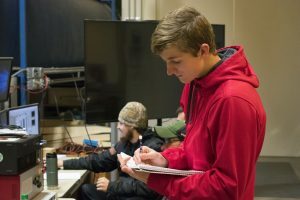 Rouser agreed to let them test it and two of his graduate research assistants studying aerospace engineering, Kylar Moody and Connor McCain, volunteered to help the students run the wind tunnel. Rouser gave the students some suggestions on their plan for testing the tee, as well as explained the science behind why the tee failed or succeeded when it did. The team tested both the standard tee and their new one by setting it up at different angles and then steadily increasing the wind speed until the ball fell off. This simulated the effect that wind coming from different directions would have on it. They also set up the ball as they would for different types of kicks in a game. “Those students made a great design, and I hope they will continue with more iterations,” said McCain. Photo 1: Meridian Technology Center seniors Caden Williams (left), Wade Lopp (center left) and Zach Frazier (right) test their Pre-Engineering capstone project and find that their football tee design outperforms the standard football tee in almost every test in Oklahoma State University’s Subsonic Wind Tunnel. 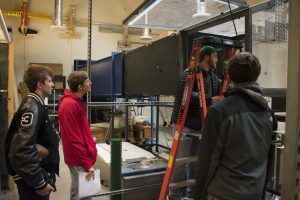 OSU graduate student Connor McCain (center right) showed them how to set up their experiment in the wind tunnel. 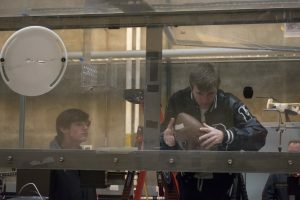 Photo 2: Zach Frazier (left) and Caden Williams (right) adjust the angle of their football tee as they test it in OSU’s Subsonic Wind Tunnel. Photo 3: Wade Lopp records the results of the test as OSU graduate student Kylar Moody adjusts the wind speed.